What About Other Views of Genesis? When biblical creationists take a stand for the plain reading of Genesis (historical-grammatical exegesis), some people get on the prod and want to throw down. Those are the ones who belong to cults, the Old Earth Creationists, Progressive Creationists, others — and especially theistic evolutionists. (For extensive material on theistic evolutionists, see "Waterless Clouds, Wandering Stars"). I'm puzzled as to why people who call themselves Christians want to compromise on what God's Word plainly says in order to accommodate atheistic interpretations of man-made science philosophies. I'm also amazed that compromisers team up with haywire atheists in attacking us; it gets mighty difficult to tell the atheists from those "Christians" at times! 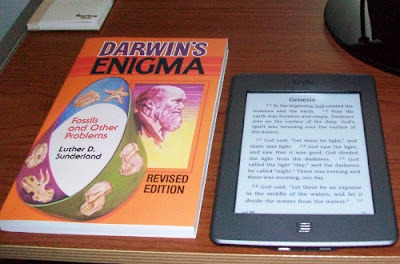 My e-book reader and an actual paper book. "Science has proven that the Bible is wrong, Genesis must be an allegory, and science — "
Yeah, yeah. Hooray for the religion of Scientism. But science views keep changing, and a good understanding of science will show that there's a whole passel of circular reasoning and cherry-picked data to support long ages. But why stop there? "Science" has shown that there are no virgin births, nobody can change water to wine, people are not raised from the dead, and so on. Keep on compromising, throw away your Bible and watch videos of cats (here's one of a cat chasing a bear up a tree). Don't disunderstand me, no respectable (and knowledgeable) creationist says that believing in a literal, recent creation is a "salvation issue". However, we do contend that it's not consistent and does violence to the text, as I indicated. For example, dealing with what Jesus said about six-day creation is difficult for those people, and they come off sounding like they really don't believe the Bible at all. When Christians began to give science over to the materialists, one consequence was rampant compromise on Genesis, despite the fact that church history shows recent creation being the established view. Even though material from owlhoots like Hutton, Lyell, Darwin and others was unscientific and sometimes dishonest, Christians were buffaloed into believing that "science" had "truth" above the pain teachings of Scripture. One accommodation for deep time was around 1814 when the Gap Theory was introduced. It was discredited, but people brought back this zombie of bad theology. The strange concept shoved millions of years between the first two verses of the Bible. In addition, it included a pre-Adamite race of hominids, the rebellion of Lucifer, a flood wiping out all life back then, plus the misuse of the word "replenish" in Genesis 1:28 KJV. One simple problem is that God told Adam and Eve to replenish (correctly translated, "fill", Genesis 1:28) the Earth, but how can it be refilled when it was never filled with humans in the first place? Just a thought. The Gap Theory involves mistranslations, eisegesis, Scriptural saddle swapping, and much more. I recommend reading "From the beginning of the creation — Does Genesis have a ‘gap’?" Some people will complain that we need to allow for "other interpretations" of Genesis. Why should we? Sure, people have a right to their opinions, but if they study on it, they should see that the only way to get millions or billions of years out of Genesis is to put them in there to begin with, and then commit massive eisegesis. That leads to a domino effect of compromise throughout the Bible, making Peter, Paul, Jesus and the others into deluded fools or liars! Listen up, Pilgrim: If you want to be a consistent Christian, you should know who Jesus is, and also what he believed about creation. Unless you have not only a low view of Scripture and its authority, but also a low view of Jesus, then we can't help you.